We recently did speed networking at a San Diego Biotechnology Network (SDBN) event , and many of the scientists were pleased with the number of connections they made, and asked when we would do it again. This made me stop and think about the importance of face to face (f2f) interactions, and why they are more important than ever these days. The fact that we can connect online now in more ways than ever is powerful, but it makes face to face interactions and events more important in many ways, and we’ve outlined a few below. The Personal Touch. At all of our SDBN events, I make a point of verbally inviting everyone I meet to connect with me on LinkedIn. Yes, this benefits me, but it also helps younger scientists feel less shy about reaching out to me online. Seeing that I’m a real person, who wants to help them, is important, and is much more successful than inviting someone I’ve never met via email. The fact that we all get so many electronic messages a day has made us understandably suspicious. Think about it, probably 99.99% of human interaction, over history, has been f2f, and we’re ‘wired’ for it (ironic pun intended ;). Serendipity. As noted recently by Xconomy’s Luke Timmerman, attending biotech events sets you up for ‘concentrated serendipity,’ since running into highly relevant professionals, whether you know them or not, is very likely. Even though travel budgets are tight, and so much can be done online (the recent ScienceOnline2010 conference even had a presence on Second Life), make an effort to go to conferences and networking events. Being in San Diego, we’ve learned the benefits of attending most of the local conferences even if they aren’t exactly in our area. Word of Mouth. You likely know I’m a big Twitter fan, and often go to ‘Tweetups,’ or informal get-togethers with people I interact with online. These meetings are great because you get to know people IRL (in real life), which is often much different than through the internet. What I’m always struck with, however, is how almost every time I get some advice that I follow almost immediately. For example, at the last Tweetup, I learned about Google Maps for the BlackBerry (completely awesome, you should be using it–I’ll tell you in person next time I see you ;). Now, we all get all sorts of advice from friends through email, etc. during the day, but hearing it verbally really trumps most electronic forms of communication. Whatever message you’re looking to get across, there is nothing more powerful than word of mouth, it is thought to be thousands of times more effective than other methods. Chemistry. At Comprendia we love skype and GotoMeeting, they allow us to present information to anyone, anywhere, and they do offer some of the elements of f2f interactions. During a recent GotoMeeting session, however, I told a joke and I have no idea how it went over, as I couldn’t hear laughing. If you know me, you know I like to use humor as an ice breaker. If you’re not f2f, however, the ice may never be ‘broken’ and it is hard to tell whether you’ve got good chemistry. Now, it’s not always paramount for a client-vendor relationship to have good chemistry, but if you’re going to partner with a company, it is very important. Being f2f is the best way to determine whether you understand each other and will be able to work together in the long term. My point? Get out there and meet each other! Through our experience with the SDBN, we frequently see the wonderful benefits of f2f interactions. Everyone from more senior professionals, who might not have extensive online networks, to those who are more junior and may live in the ‘IM’ world too much, can benefit from more f2f interactions. I agree with your comments. 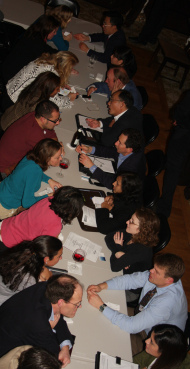 I’ve attended “speed dating” events in the biopharm sector twice a year for the past several years. You’re right – there is no substitute for speaking customers directly. Clearly you can have more in depth and nuanced conversations than by other means. It is a good opportunity to clear up misimpressions and to introduce new capability areas that the customer may not be aware that you can help address. Nothing like 14-18 meetings in a couple of days. I too follow up by inviting customers to join me on LinkedIn, but I haven’t tried making the connection overtly on Twitter and maybe I will now.